The National Conference on Artificial Intelligence remains the bellwether for research in artificial intelligence. 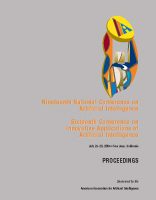 Leading AI researchers and practitioners as well as scientists and engineers in related fields present theoretical, experimental, and empirical results, covering a broad range of topics that include principles of cognition, perception, and action; the design, application, and evaluation of AI algorithms and systems; architectures and frameworks for classes of AI systems; and analyses of tasks and domains in which intelligent systems perform. The Innovative Applications of Artificial Intelligence conference highlights successful applications of AI technology; explores issues, methods, and lessons learned in the development and deployment of AI applications; and promotes an interchange of ideas between basic and applied AI. This volume presents the proceedings of the latest conferences, held in July, 2004.